Natalie Cole was eliminated from Survivor: David vs. Goliath after the entire cast was evacuated due to a storm during the latest Survivor Season 37 episode on CBS. 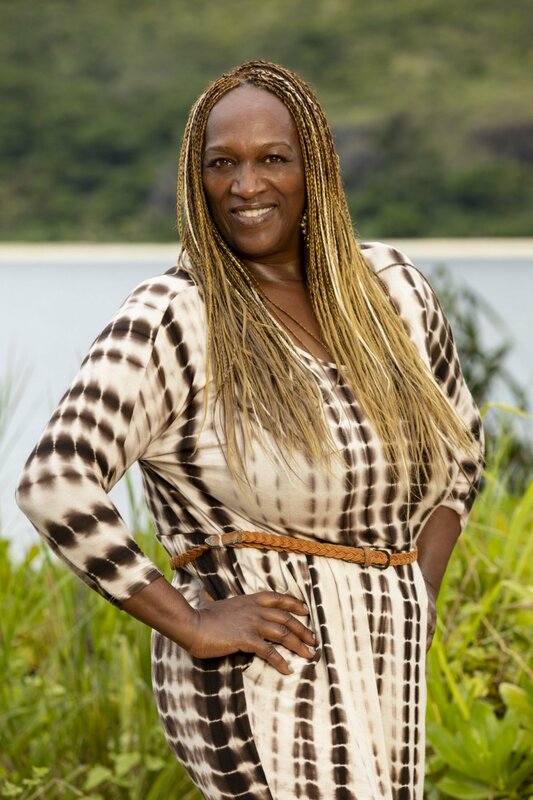 Natalie, a 56-year-old publishing CEO from Los Angeles, CA, became the sixth castaway to leave the game on Day 15 through a 3-2 vote instead of Lyrsa Torres, a 36-year-old airline agent from Puerto Rico, who currently resides in Boston, MA, at Tribal Council after their Jabeni tribe lost the Immunity Challenge. "I don't feel like I deserve all of the bad rap that I got. Some of the things that were said are true; however, I was loving the game and my only regret is that I didn't stay in the game longer," Natalie said following her Survivor ouster. During a recent exclusive interview with Reality TV World, Natalie talked about her Survivor experience and seemingly volatile relationship with many of her fellow castaways. Below is the concluding portion of what she had to say. Reality TV World: Going into your final Tribal Council, was there any talk of hidden Immunity Idols? Any suspicion someone had one? Natalie Cole: No, there was no talk, though I was looking! I spent hours digging and pulling up trees and looking around, and I could not find one. I was out on Day 1 looking. Reality TV World: So tell me what happened when you got evacuated from the game due to the cyclone. Where did you go and how long did you stay there? Natalie Cole: We just went not too far from where we were. We got away from the water. That was the most troublesome time for me because I absolutely had the best time doing the cyclone. So I wasn't thrilled when we got evacuated because everyone was having a meltdown and I felt that was a huge advantage for me, because the cyclone stirred everybody and I was the only one that was really, really solid during the cyclone. So the evacuation is a bit of a blur, and by then, I had not slept for four or five days. So it's a blur to me, that aspect. It didn't mean anything. I sat up and was thinking and they went to sleep. And the lockdown didn't have an effect on me one way or another because they weren't talking to me anyway! And when they did talk to me, it was not real. I really don't have a strong feeling about the cyclone and the evacuation. I was enjoying being in the cyclone because from what I saw and heard, it created drama and meltdowns and there was almost a physical fight. I was enjoying the cyclone, so when we got evacuated, things went back to normal for the Goliath tribe. Reality TV World: I want to talk more about the exchange you had with Nick Wilson over his jacket. He thought you were bullying him, but you simply called it "a negotiation." Could you give me an example of what would've made that conversation bullying in your mind? Natalie Cole: Here's the thing, I think it goes back to my direct way of communicating. You really don't have to think about what I intended to say and what you thought you heard me say because I speak so directly, and so I'm very clear about what I think. And I think that kind of drove people off. So I think I did say it to him very directly, but what I did not say that seemed to be shown based on the perception last night was that I wanted his jacket. When he came back to camp, he said, "What's going on?!" And [Mike White] and I were working on the shelter and I said, "Well nothing other than [Angelina Keeley] wants Lyrsa's jacket." That was the comment I made. And as he came over to me later, he was telling me why he thought he should stay vs. Lyrsa, and I said, "Well..." -- I was basically letting him know it was boiling down to the jacket. "Angelina needs a jacket. Is that jacket worth a million to you?" So in retrospect, I could have said that [in a way that wasn't] bullet-point fashion. I could have elaborated to explain it. And it became a thing about me. But that was already a setup, because Angelina and Mike had already dropped dimes and made little innuendos and actually told the [Davids] what occurred with me and the Goliaths before we got there. So they didn't even have to search for a crack in the Goliath. I was a glaring crack based on who was left on the island with me. Reality TV World: How were you cast on Survivor this season? Was it your first time applying? Natalie Cole: It was actually my first time applying. I applied literally one time and I -- well, actually, let me correct that. I applied for the first time at the end of 2015, and I did get a call back and there was some conversation. It was minimal and then it went dark; I didn't hear anything more. And then I got a call -- I want to say at some point in 2016 -- to see if I still had an interest. So I really applied one time and then they came and followed up with me in 2016, I think in August or September. So they asked me if I still had any interest and then they asked me to resubmit and update whatever I had submitted. So was that technically two times or one? I think it was one, but you be the judge! To read the rest of Reality TV World's exclusive Survivor interview with Natalie Cole, click here for Part 1 and here for Part 2.